Potluck and conversation about the future of education in Colorado and what it means to present and future citizens. Bring a dish, a friend and ideas to share. We invite you to join hundreds of educators, parents, students, academics, authors, activists, and other change-makers at this year’s conference, Transforming Education & Our World. For the first time in our eight year history, AERO conference will be held on the west coast in beautiful Portland, Oregon, August 4-7, 2011. Bring PLTI or FLTI to your community! After teaching elementary school for 29 Years, Representative Solano headed to the Colorado Legislature where she has represented the voice of children for the past seven years. In a climate where education policy makers keep getting it wrong, Solano understands that best teaching practices mean relevant learning and relationship building. Many times she has stood alone against both Democrat and Republican’s costly education reforms that evaluate teacher performance, student learning, and school quality through a single measurement tool. 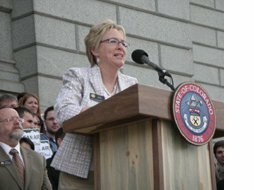 Under the slogan, “kids before corporations,” Representative Solano has courageously introduced legislation that reduces high-stakes testing, returns assessment and evaluation to professional educators, and promotes education improvements that lead to opportunities, not sanctions, for Colorado’s children.